Communal living to the previous generation meant that you had to take turns cooking for all the residents in your community every Sunday at a common hall. The fact that you had to do anything in the name of community kind of melted the concept in my book. – At The Orion in NYC, the laundry room hosts a pool table, free breakfast is offered on weekdays, and residents even have their own online message board to discuss things like happy hours, book clubs and getting together to play volleyball. – The Downtown Club in NYC has a BYOB bar and a party room. 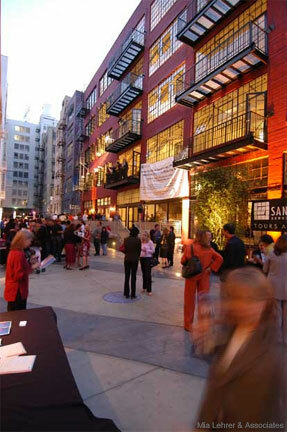 – At the Santee Court (pictured) in downtown LA residents enjoy communal rooftop decks (one with a 1/2 basketball court), gyms, pools, courtyards and BBQ, along with a six-restaurant food court. Needless to say, the units are selling faster than expected. As for the building I live in, we just christened a new roof deck and use our lobby for happy hours. Many of the neighbors now know each other as a result.